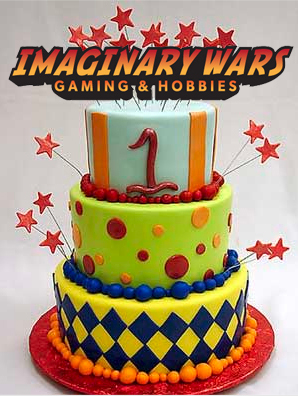 One year ago today, Imaginary Wars opened its doors for business. What can I say? I’m exceptionally grateful to all the people who have helped and supported the store this past year. Without all the awesome people in the community around me, this store would never have come into being, never mind still being here one year later. I was hoping to do a bit of a review of the store’s highlights over our first year, but I’ve ended up having all my time getting devoured by my getting ready for the upcoming Calgary Comic and Entertainment Expo, the International Table Top Day we ran in the store last weekend (to great success, I might add! ), I’ve also been keeping abreast on our Heavy Gear League (which includes me having to paint up my own stuff –have I mentioned that my painting pace is …glacial? ), trying to post on this blog more regularly, and managing our promotions for Games Workshop’s Tau releases as well as the new set for Magic the Gathering’s Ravnica block, Dragon’s Maze. On top of that, I’ve been running the store’s first year anniversary Facebook Contest …and finishing planning some sort of festivities for Saturday, April 6 when we’ll be officially ringing in our first year. After re-reading that last paragraph, I’m left wondering what I’m doing still writing today’s post. However, I am exceptional at getting too caught up in taking care of things (or looking towards the next fire I might need to put out) that I quite regularly forget to mention and thank all the unsung individuals who help me out every day–my wife being first among them. There are plenty of others, but she’s the one who puts up with me (and the store) the most. There’s also my business partner and the family and friends who helped get the ball rolling and the store started, all of whom –just as with my wife– I cannot thank enough. Anyways, I’ll end things here –but if you live in Calgary (or close enough by), come down to the store THIS Saturday, April 6 and celebrate our first year with us. OF COURSE there will be cake and refreshments and board gaming and maybe a few more things going on that day …like deals! I’ll be at the store ALL day. If you don’t live in or near Calgary, just remember that **shameless plug** if you live in Alberta, shipping is free, with no minimum purchase amount!